Glebe Walks | The Glebe Youth Service, formerly the Glebe Moving Picture Show. The Glebe Moving Picture Show opened in 1910 and had a dramatic impact on Glebe life, and a night at the “pictures” quickly gained wide popularity. Jack Law, the proprietor, boosted patronage by staging boxing exhibitions and vaudeville acts by ‘Reckless Reggie’ before the show. The building was shared, at various times, by a billiard saloon, a hairdresser and a confectioner. The Laws were one of a number of extended families who made Glebe their home. They were Methodists. ‘Jack’ Law, born in 1857, was one of 12 children (9 survived childhood) and lived all his life in Glebe. Like his father and brother George, he described himself as a ‘dealer’, ie, a trader or merchant. He married Alice Blanche May at Glebe in 1877 and they had eight children. After Law’s death in 1926 and that of his wife Alice three years later, the Glebe Motion Picture Theatre continued under other proprietors but seems to have closed in the mid-1930s. 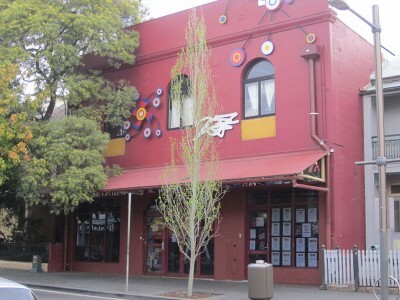 This building has been the home of the Glebe Youth Service since 1995.